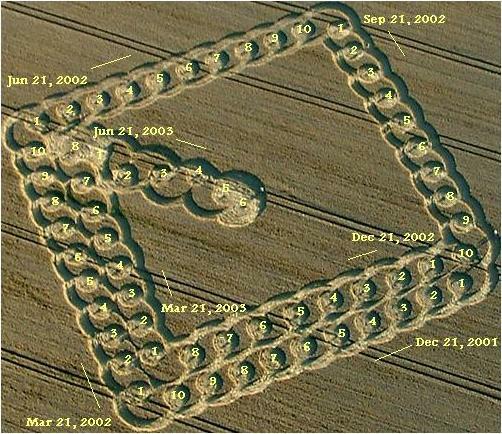 Last night I did a meditation on the Aug 2, 2003 Eastfield crop circle which I felt certain was very important to Planet X. A key points of what I intuited is the uncharacteristic squareness of the overall design as being a reference to the solstices/equinoxes as these represent 4 corners of time as the Earth circles the sun. 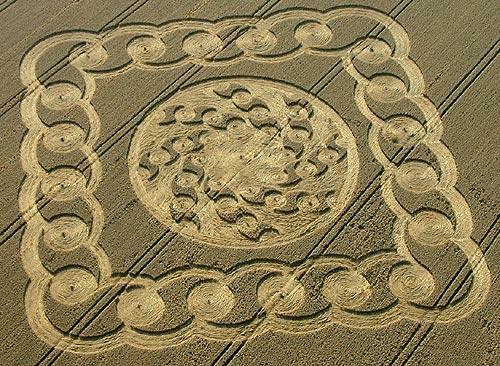 The solstice this summer was June 21 (the day of the Waden Hill circle). I too focused on June 20 as a start point, quite aside from you, and neither of us putting this on the web or posting for others to see! It was known that at this time, approximately Feb 1, 2001, the 12th Planet would be visible without question to an observatory. The Neuchatel observatory got it. They are very excited, wondering if it is a comet or a brown dwarf, through the latest coordinates you gave. I'm going to ask for further details. The daughter of the astronomer reports that they suspect a comet or a brown dwarf on the process to become a pulsar since it emits "waves". On the night of Sunday April 1st 2001, I reserved the historic Clark 24" telescope at the Lowell observatory in Flagstaff, AZ, for my own private viewing. Lo and behold, there appeared a faint blip not too far off center. Taking the Dec 21, 2002 Solstice as a starting point in the Aug 2, 2003 East Field circle, year 2002 is fairly normal, but by the start of 2003 the Earth has begun a spiral into a trap. June 21, 2003 is the Summer Solstice. On June 20 and June 23 massive and notable Global Quakes occurred. On June 22, the Zetas indicated a notable Stage Set point. If the circles reeling into the center trap, where the 23° tilt of the Earth is subject to being forever changed, indicate the weeks following the Summer Solstice, then the end of August should see some changes. Post Mortum Results: On Aug 21 the Australian Plate adjusted with major Global Quakes note seen since Aug 4. The next major Global Quake occurred on Sep 21, with 8+ quakes ensuing in Japan and Siberia shortly thereafter.